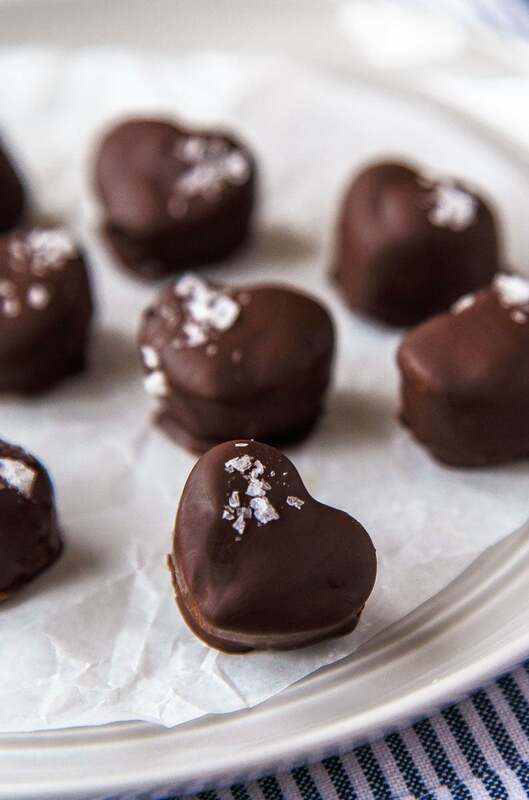 Chocolate peanut butter truffles with a sprinkling of sea salt on top. 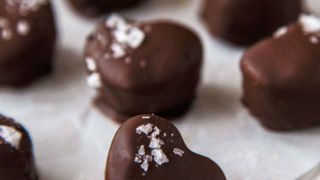 Heart shaped truffles for a cute Valentine’s day homemade gift. 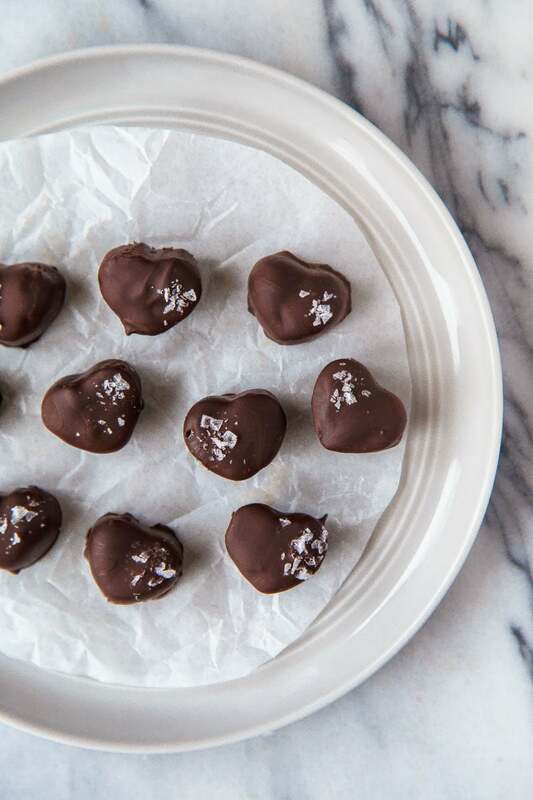 I first shared these truffle recipes last year for Valentine’s Day, which I clearly made so I could stress-eat while bidding on houses. Just for fun, I thought I’d tell you that we didn’t get the house, and have been really grateful for that ever since. Sometimes things don’t work out because cooler things are meant to happen. ANYWAY, I hope you enjoy these mini Reese’s peanut butter cups shaped like hearts. I know I did! When I was writing my list of Valentine’s Day desserts for two ideas, a recipe for ‘chocolate-peanut butter something’ made the list. I hadn’t exactly fleshed it out yet, only knowing I wanted to do some kind of variation on the power couple that is chocolate and peanut butter. I bought a mini heart-shaped mold about 3.28 seconds after Adrianna posted these adorable sugar cubes, and knew some heart-shaped bites were in my future. These chocolate peanut butter truffles were meant to be before I even finished the full thought process. 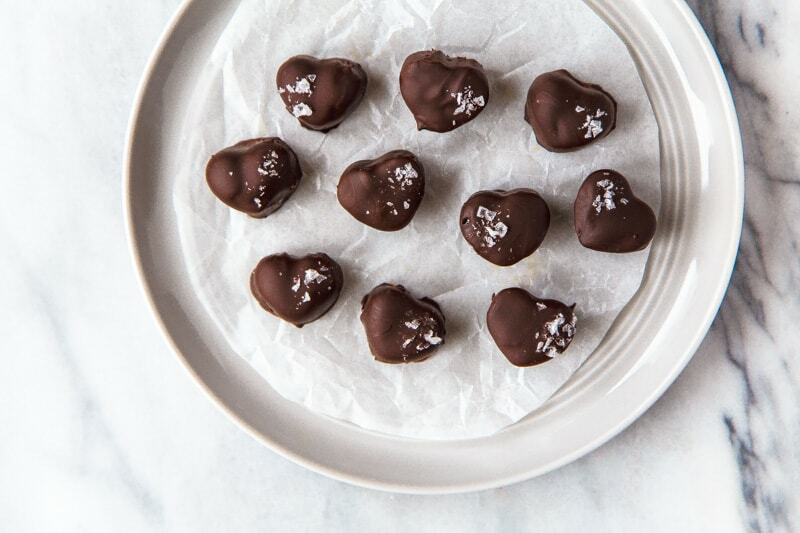 Chocolate peanut butter truffles, the ultimate distraction. Ok, I’m sitting here writing to you acting like it’s no big deal, but I’m clearly distracted. My husband is out of town and I’m bidding on a house. They countered my first offer, and I’m over here shoving chocolate peanut butter truffles in my mouth trying to deal. I’m holding my ground. I’m also practicing the phrase ‘That is my final offer.’ I’m basically pretending I’m one of the sharks on Shark Tank. It’s not going so well. But, at least I only interrupted my husband once for a pep talk on negotiation skillz. I’m trying to stay emotionally distant from it (the house, not my husband), and so if I get it, great. If not, there will be others (still not talking about husbands). It needs a complete kitchen renovation, and that scares me. But it’s SO FUN looking for ideas on Pinterest—just don’t make me decide on a single thing, thanks. All I can decide is which side of the peanut butter truffle to eat first–the salty side or the plain? Always the salty side. Always. Make these mini Reese’s peanut butter cups in the shape of a heart for your Valentine. You might gobble them up in 3.28 seconds, which is the exact amount of time it took me–oh, never mind. The realtor is calling. I’m out! In a small bowl, combine the peanut butter, sugar, honey, coconut oil, vanilla and salt. Place in the microwave and pulse until the coconut oil melts, and the mixture is smooth. I use the peanut butter that is ground in-store; the only ingredient is peanuts. It's a little chunky, but I think that's a good thing. Use what you like. Press the peanut butter mixture into a candy mold. The one I used is here. It holds 1 teaspoon of water, for reference. Pop the candy mold into the freezer to set the candy for about an hour. Test it to ensure the hearts pop out easily. I really recommend a silicone candy mold. Meanwhile, chop the dark chocolate and combine it with the coconut oil in a microwave-safe dish. Microwave on 50% power in 30 second intervals until almost melted, stirring between each time. Let the chocolate rest on the counter, stirring occasionally, until it melts completely. Remove the peanut butter hearts from the freezer, dunk in the melted chocolate using a fork to drip excess chocolate. Place them on a a wax-paper lined plate, and sprinkle with a dusting of salt (optional). Freeze truffles for 15 minutes, until set. 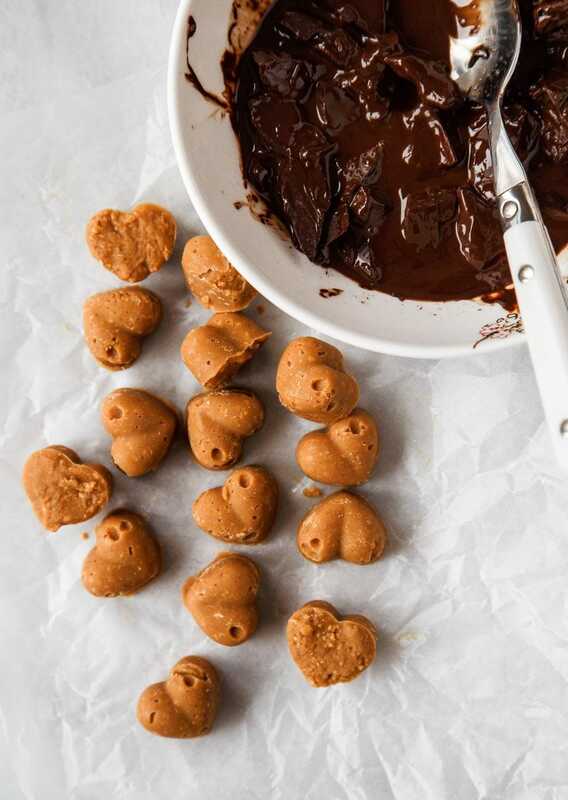 Oh hello there beautiful chocolate and peanut butter hearts! I love the chunky salt addition–always welcome with chocolate. Good luck on the house–I haven’t had to experience any of that yet but it always looks so stressful on TV :( but I’m sure there’s nothing PB hearts can’t cure! this is going to happen all year long!!! thank you sharing :) we have started the house hunting process on the internet so far and im already overwhelmed. hey girl great post! Good luck with the house! hope you get it! And the peanut butter hearts look yummy! Are these to be stored in the fridge after being assembled or are they room temperature stable? Mmm…peanut butter and chocolate! Good luck with the house hunting!! ohhmaagaaaaaaa – pb and chocolate are THE perfect flavour combo – valentine’s day or anytime. that mold is super cute too! I wish i could shove pb hearts in my face right. now. Hope you gget/ot the house. You will have a blast doing a kitchen renno. It is so much fun designing exactly what you want and seeing it come to life.If it all goes down, I look forward to followingto the possibility you will share it her on the blog. These look so good, I think I might need to double the recipe! Peanut butter cups never last long around our house and the bf and I are always argue over who gets the last one. Good luck on the house – we just went through the whole process last year in Seattle and its stressful – but everything will all work out in the end and you’ll find the house that’s meant for you! These look amazing- definitely going to console my single heart with these this Valentines Day! Good luck on the house!! Oh my these look to die for! Perfect to make for my hubby for Valentines day. Question about the coconut oil, can you substitute for that? Will they come out the same? I wouldn’t substitute. I called for coconut oil because it’s liquid when warm, and solidifies when cool. Have you had any trouble with this silicon mold? I have the same one, but I’ve only used it for molded chocolates. I’ve gotten a powdery residue on it (and other molds by this company) that nothing seems to get rid of. I’ll have to try the peanut butter filling in it, since I can no longer use it for chocolate! YES! Can you see in the photo that has the mold that is has some kind of residue on it? UGH! I thought it was just because I put it in the dishwasher. Before I use it, I clean out the cavities really well with a dry paper towel. But yeah, I’m not super happy with this mold either. I should stop linking to it! Glad to know I’m not the only one with the problem! I’ve tried all kinds of things, even boiling the mold, but nothing helps. Too bad, because it makes such cute candies! I made the pb hearts yesterday and they were very tasty. My PB loving valentine will love them! EEEE I hope everything worked out with the house!! Because you’re amazing. And you shared these. These beautiful, perfect, sweet and salty heart that I adore. And am pinning!